Working professionals are constantly juggling multiple projects, commitments, and deadlines at once. Multitasking becomes the name of the game, whether that entails conference calls during dinner or filling out spreadsheets in bed. Many successful walkers of the packed-schedule tight rope allow health to fall by wayside when pressed for time. Eating healthy at work and maintaining optimum nutrition seems like a luxury when you’re balancing so many obligations. However, there are surefire methods to staying healthy and eating proper foods during your hectic day. Follow these tips for a healthier you. The first step to proper nutrition is proper hydration. To keep your digestive tract happy and your brain functioning at full capacity you should train yourself to bring a reusable bottle of water to work everyday and fill it back up numerous times before going home. Drinking plenty of water is a terrific way to stay energized, and water provides innumerable health benefits. Socializing and accomplishing team goals while eating is an efficient use of time. 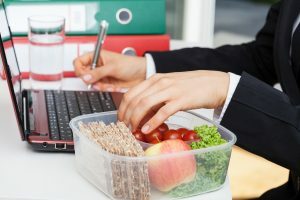 Ensuring that you have a full scheduled meal during the day while interfacing with coworkers and colleagues is a great way towards eating healthy at work. To really jumpstart your digestion, plan a walking meeting and take your lunch on-the-go. Activating your muscles and stimulating your senses by getting outside will keep you alert, and bringing your lunch with you will force you to pack modest, appropriately-sized lunches. You know your body better than anyone – keep track of your eating habits throughout a typical workday, then pack healthy snacks and meals that mirror your standard schedule. If you know you’ll need two full meals during the course of a day, pack veggie-centric and light meals. No preparation will lead to more fast food meals and microwavable meal purchases that will be high in sodium, fat, and calories. A huge part of eating healthy at work is simply not eating junk food. Rid your office and kitchen of temptations like chips, cookies, candy, and soda so you’re not tempted to indulge in sweets after finishing a project or making it through a taxing meeting. If you remove the unhealthy options from the workplace altogether sticking to a healthy regimen of food will prove far easier. Of course, when it comes down to it, you’re most likely wanting to know what snacks and foods you should keep handy in the first place. Here’s a substantial, but far from complete, list of ideas for healthy alternatives to junk food snacks. For more snack ideas check out this blog at EXOS. Greek Yogurt and Berries – high in protein and probiotics, a small cup of Greek yogurt blends beautifully with a handful or two of fresh berries. Organic berries will contain higher amounts of antioxidants. Pear and Cheese – Stick with a fat-free mozzarella stick and a ripe pear for great portion control. This snack is high in vitamin C, potassium, and calcium. Edamame – eating a small serving of edamame is filling and is packed with important fiber and protein. Easy enough to boil or heat up in the office kitchen. Oranges and Almonds – Oranges are 90% water, helping you stay hydrated, and almonds are a great source of fiber and heart-healthy fat. Packing these healthy alternatives to snacks like chocolate or candy will go a long way to keeping you healthy and alert. Keep your focus and energy up by avoiding a sedentary style of work – stretch, go for walks, and use a Wurf board to activate muscle groups and relax your body. Coupled with eating healthy at work, these tips will keep you in great shape even with a packed schedule. Check out this related blog on healthy habits for the new year!